Bentley Continental GT's V8 line-up also gets the latest updates from its bigger, W12 line-up with the arrival of the third-generation models. After introducing the signature Continental GT Convertible W12, Bentley has now lifted the veil off the third generation Continental GT and GTC V8. Both V8-powered models receive the new-generation 4.0-litre twin-turbocharged motor which develops 542bhp and 770 Nm of torque. While the W12's roar will be missing, Bentley claims the rumble of the V8 won't exactly be 'subtle' either. The dual twin-scroll turbochargers are located inside the 'V' of the engine (much like the new Porsche Macan Turbo) to keep the lag to a bare minimum, which results in a top speed of 318km/h (both versions) and a 0-100km/h sprint time of just 4.0 seconds for the Coupe and 4.1 seconds for the Convertible. At low speeds, the engine can turn off half of its cylinders for better fuel efficiency. The new, third-gen V8 models come fitted with 20-inch, 10-spoke alloy wheels as standard. However, customers can further choose from an option of nine other designs and can upsize to 22-inches. Both cars will be offered with seven exterior colour options as standard. While the W12 models of the Continental GT feature dual exhaust pipes, the V8 models can be differentiated on the basis of quad exhaust pipes and V8 badging on the front quarter panels. The GT Convertible V8's roof can be operated on the fly, at speeds of up to 50km/h. Both models also get Bentley's latest Matrix LED-based lighting. Inside, the biggest change comes in the form of an advanced, fully-digital instrument panel which can also be ordered with the optional Bentley Rotating Display. The latter features a 12.3-inch touchscreen housed in a three-sided unit, which revolves the veneer to reveal the touchscreen, as well as three analogue dials. While the W12 models can be ordered with three different audio systems to choose from, the V8 models will only offer Bentley's standard 650W 10-speaker setup. 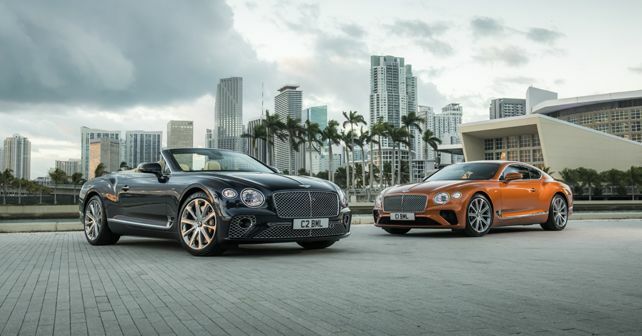 While Bentley has opened its order books for the new V8 Continental GT and Continental GTC, customer deliveries are slated to begin in the US by Q3 2019. Deliveries in other regions are set to begin in the first quarter of 2020.